General Plastics’ open-cell flexible polyurethane foams deliver efficiency while absorbing energy at a consistent, controlled rate. Our flexible foam sheets can be used in series or in parallel to relieve static stress on flexible shock-attenuation material. They can also break up resonance or change shock-pulse frequencies. Elevated temperatures have little effect on the performance of LAST-A-FOAM® flexible foams: There are no long-term effects up to 180°F, with an approximate 10% reduction of firmness at the higher temperature. These flexible foams can withstand temperatures up to 160°F and reduced temperatures, although at subzero the foam can become significantly firmer. 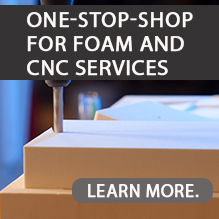 LAST-A-FOAM® flexible foam products are available as sheets, blocks and molded parts. We can assist in part design, tool design, mold-tooling manufacturing, and production of parts through all phases to completion. We also custom-formulate appropriate flexible foam systems to make the exact part you need. Manufactured in densities of 3 to 7 lbs. per cubic foot, this series offers superior vibration isolation and cushioning for loads in the 0.1 to 2.0 psi static stress load range. These flame-retardant foams offer comparable properties to the TF-6070 series, except that a slightly higher foam density would be needed under equal circumstances. These foams are designed for shock isolation of heavy objects when the supporting foam will be under long-term static stress. These open-cell polyurethane foams exhibit high hysteresis (approximately 80%) as well as excellent recovery from dynamic impacts. Our flame-retardant, flexible foam-filled Nomex® honeycomb material serves as a multi-purpose aerospace seal and filler.